In technical terms, gestation refers only to development within the mother's body. In common parlance, however, gestation can describe offspring development from beginning to end, whether inside the womb like a human or outside the body in an egg like a goose. Some types of geese take longer to hatch than others, but nearly all take between 28 and 35 days from the time the female lays the egg. 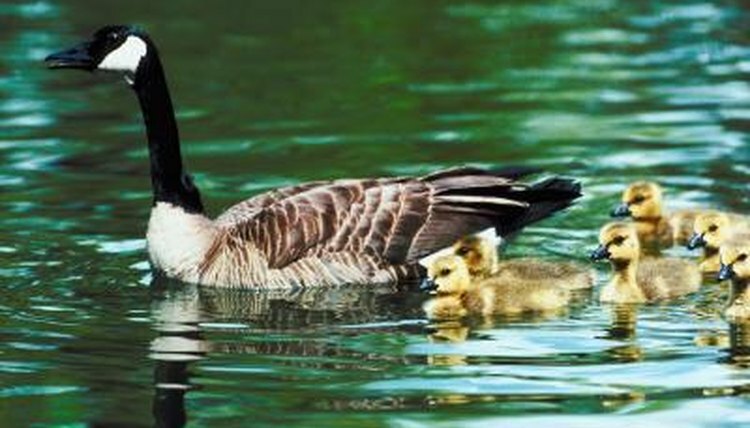 Smaller varieties tend to fall toward the shorter end of the range, while larger geese are typically at the longest end. The amount of time a particular egg takes to hatch can depend on when it was laid in relation to others in the clutch, or group of eggs in a single nest. Some geese take their time laying eggs, depositing about one egg every two or three days. A week or more may pass between the first and last egg, all of the eggs will hatch within a day or two of each other. It takes an average of three days for a new gosling to hatch completely.